Optic nerve sheath fenestration (ONSF) procedures were first described by De Wecker in 1872 as an incision in the meninges surrounding the optic nerve in order to relieve elevated intracranial pressure. [1, 2] The procedure is typically performed in instances of papilledema due to idiopathic intracranial hypertension (IIH), in which the main symptom is rapid and/or progressive vision loss rather than headache. The effect is normally limited to the ipsilateral optic nerve, although occasionally the procedure appears to have a filtration effect, which is propagated along the entire system, resulting in improvements in headaches and contralateral disc edema as well. Typically however, the effect is limited to the ipsilateral optic nerve. The image below depicts optic nerve sheath fenestration. Incision of the dura arachnoid is made with a long-handled 15º blade once careful visualization is made with retraction. Cotton-tip applicators are gently used for hemostasis. IIH usually occurs in obese females 20-45 years of age. Patients must undergo a complete ophthalmic history, neurologic examination, and an ophthalmic examination including visual acuity, color vision, pupillary assessment, motility, visual field testing, and funduscopic examination to evaluate for presence and extent of papilledema (swelling of optic nerve). Emergent neuroimaging (CT scan or MRI) should be performed to rule out any intracranial processes such as dural sinus thrombosis, which can result in papilledema. Lumbar puncture must be done to check the CSF composition and opening pressure. Blood pressure should also be recorded. Medical treatment of idiopathic intracranial hypertension should be instituted, including weight loss, acetazolamide or furosemide, and systemic steroids if needed. If vision loss continues despite these measures, ONSF should be considered. Preoperative discussion should include reviewing the risks of orbital surgery in such a proximity to the optic nerve and the need for continued treatment of the underlying disease process, as this procedure is not a cure for the disease. If bilateral vision loss is present, the eye with more severe vision loss should undergo the procedure first. Indications include idiopathic intracranial hypertension with rapid or progressive vision loss. General anesthesia is recommended for this procedure. If necessary, due to patient health, and in experienced hands, it may be performed under local anesthesia. The patient should be positioned in a supine position. Patients should avoid anticoagulants perioperatively. Approach and technique for an optic nerve sheath fenestration varies. This article describes a transconjunctival medial orbitotomy approach. Through this approach, after decompression is achieved, an optic nerve sheath biopsy may also be performed. After general anesthesia is performed, the eye and eyelid are prepped and draped in a standard ophthalmic surgical fashion. An eyelid speculum is first placed. Peritomy at the nasal limbus is performed with relaxing incisions and dissection down to bare sclera. The medial rectus muscle is isolated with a muscle hook. Next a double-armed 5-0 Vicryl suture is passed through the insertion of the medial rectus with locking bites at the inferior and superior aspects of the muscle. The muscle is then disinserted with Westcott scissors. 4-0 silk suture is passed in a running stitch fashion through the muscle stump to be used as a traction suture. Hemostasis, if needed, may be maintained with either bipolar or needle-point cautery. Using the 4-0 silk traction suture, the globe is rotated laterally, occasionally releasing it to avoid ischemia to the globe. A careful retraction of the orbital soft tissue is undertaken with a malleable retractor, until exposure of the optic nerve sheath is achieved. A Schepens orbital retractor and cotton-tipped applicators can be used to retract the prolapsing orbital fat surrounding the nerve. Once adequate exposure is achieved, a marking pen may be used to mark the planned incision point on the sheath. This point should be in the distal aspect of the nerve sheath, in order to avoid damage to the nerve itself, but at least 2-3 mm from the globe in order to avoid the vascular supply, a plexus of short ciliary vessels. A long 15 º blade, or a Supersharp blade, similar to the one used for paracentesis formation in cataract surgery, is used to make an incision longitudinally along the nerve sheath, away from the nerve in an upward manner in order to avoid injury to the nerve itself (see the images below). Extension of the initial dura arachnoid incisions made by the 15º blade is performed using a long neurosurgical, Bellucci, or Westcott scissors. Alternatively, gentle blunt dissection using a small muscle hook (ie, Jameson or Stevens hook) can also extend the incision. An egress of fluid may be observed, which indicates release of the cerebrospinal fluid under pressure. 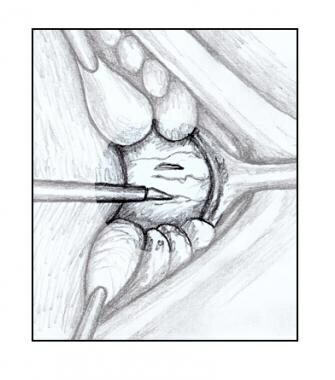 The edge of the incision should be everted with fine-toothed neurosurgical forceps and Bellucci scissors introduced to extend the incision to a length of 5-7 mm. Again, care should be taken to stay superficial, with the inferior blade tenting the dura and arachnoid layer to avoid contact with deeper tissue. A second incision, parallel to the first may be created in the same fashion. A superior oblique hook may be used to elevate the dura and arachnoid through the initial incision to assist in subsequent incisions. The introduction of the hook will also release any adhesions. Another option may be to excise this entire window of tissue between the incisions. Occasionally, this may be indicated for biopsy purposes if the etiology is in question. Hemostasis in the orbit is performed with cottonoids and cotton-tipped applicators, as well as light bipolar cautery if needed. The traction suture is then removed. The medial rectus muscle is reattached to its insertion point using the 5-0 Vicryl suture. The conjunctiva is then reapproximated with an absorbable suture. Patients should avoid anticoagulants in the immediate postoperative period. Systemic antibiotics should be given perioperatively and overnight. Intravenous steroids may also be given perioperatively and overnight. Visual acuity and pupil check should be performed a few hours after surgery, and the patient may be admitted overnight for observation. The patient is usually given an antibiotic-steroid drop for 1 week. A tapered oral steroid regimen may be given on a case-by-case basis. Typically, recovery is relatively pain-free, without the need for narcotic pain medicine. At 1-2 weeks postoperatively, the patient should be examined, and the optic nerve function should be assessed. If visual recovery occurs, it is often rapid with optic nerve function and appearance improving over the first several weeks postoperatively. De Wecker L. On incision of the optic nerve in cases of neuroretinitis. Int Ophthalmol Cong Reps. 1872. 4:11-14. Moskowitz, B. Optic Nerve Sheath Fenestration. R.C. Della Rocca, Edward H. Bedrossian, B. P. Arthurs. Ophthalmic Plastic Surgery: Decision Making and Techniques. 1. New York: McGraw-Hill; 2002. 291-4. Alsuhaibani AH, Carter KD, Nerad JA, Lee AG. Effect of Optic Nerve Sheath Fenestration on Papilledema of the Operated and the Contralateral Nonoperated Eyes in Idiopathic Intracranial Hypertension. Ophthalmology. August/2010. Muthukumar N. Taumatic haemorrhagic optic neuropathy: case report. Br J Neurosurg. 1997. 11:166-7. Milman T, Mirani N, Turbin RE. Optic nerve sheath fenestration in cryptococcal meningitis. Clin Ophthalmol. 2008. 2:637-9. Gasperini J, Black E, Van Stavern G. Perineural metastasis of breast cancer treated with optic nerve sheath fenestration. Ophthal Plast Reconstr Surg. 2007. 23:331-3. Jablons MM, Glaser JS, Schatz NJ, Siatkowski RM, Tse DT, Kronish JW. Optic nerve sheath fenestration for treatment of progressive ischemic optic neuropathy. Results in 26 patients. Arch Ophthalmol. 1993. 111:84-7. Glaser JS, Teimory M, Schatz NJ. Optic nerve sheath fenestration for progressive ischemic opticneuropathy. Results in second series consisting of 21 eyes. Arch Ophthalmol. 1994. 112:1047-50. Thuente DD, Buckley EG. Pediatric optic nerve sheath decompression. Ophthalmology. 2005. 112:724-7. Berman D, Miller NR. New concepts in the management of optic nerve sheath meningiomas. Ann Acad Med Singapore. 2006. 35:168-74. Goh KY, Schatz NJ, Glaser JS. Optic nerve sheath fenestration for pseudotumor cerebri. J Neuroophthalmol. 1997. 17:86-91. Mauriello JA Jr, Shaderowfsky P, Gizzi M, Frohman L. Management of visual loss after optic nerve sheath decompression in patients with pseudotumor cerebri. Ophthalmology. 1995. 102:441-5. Vanderveen DK, Nihalani BR, Barron P, Anderson RL. Optic nerve sheath fenestration for an isolated optic nerve glioma. J AAPOS. 2009. 13:88-90. Wilkes BN, Siatkowski RM. Progressive optic neuropathy in idiopathic intracranial hypertension after optic nerve sheath fenestration. J Neuroophthalmol. Dec/2009. 29:281-3.